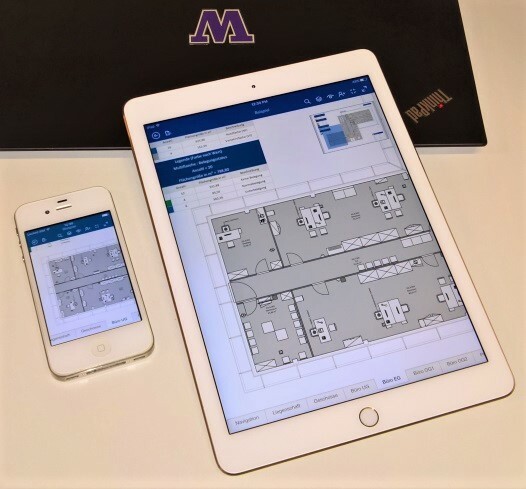 Now that we all have tablets and huge-screened smart phones strewn all over our homes and offices, looking at Visio diagrams while on-the-go or on-the-sofa is no longer a weird thing to want to do. The trouble is, it hasn’t been easy to do without some sort of viewer installed. Nektony has provided an option for several years. It is a noble effort, but not free. (By the way, they offer versions for both iOS and for Android.) If you’ve been waiting for Microsoft to get into the game, then your wait is FINALLY over. And it won’t cost you anything extra. 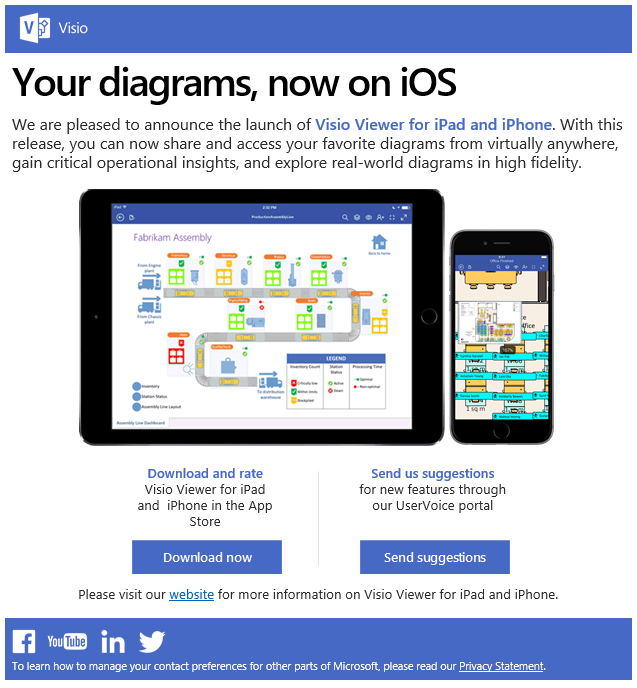 Yes, Microsoft have finally released the Visio Viewer for iOS. 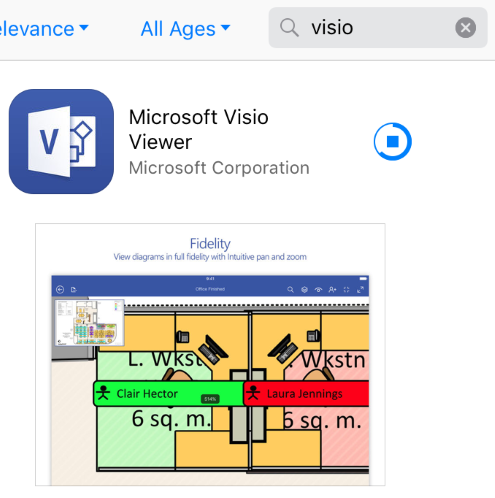 I whipped out my iPad, fired up the App Store, and sure enough, a search for “visio” turned up something shiny and new. I love that it works on that little 4s screen. Isn’t it adorable? 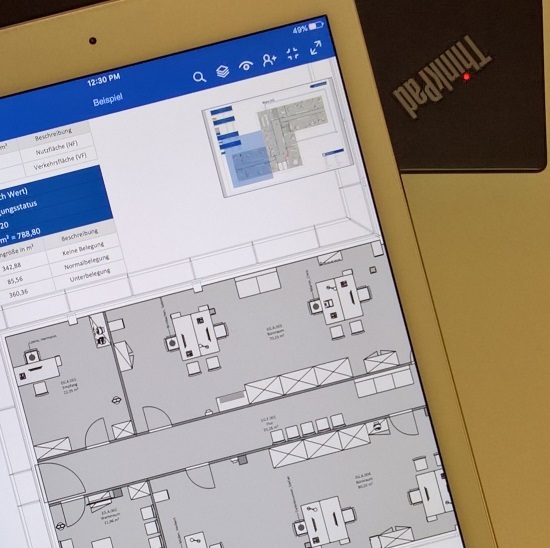 There are a few ways to get files into your shiny, new Visio Viewer. Let’s have a look. This is fine for me for the most part, but I do use DropBox for most of my work stuff, and only use OneDrive for photos and the occasional Visio Guy freebie download. If you’re keeping score, Nektony offers DropBox, Box and Google Drive, but not SharePoint. I imagine it’s not that hard to download files from these services directly to the iPad, then open them up in the viewer, but hey: computers aren’t lazy so that we can be! Microsoft’s viewer also handled multiple OneDrive accounts (I have two Hotmail accounts that I use all day long, remember Hotmail?) Nektony’s seemed to offer only one OneDrive account–or at least I couldn’t figure out how to add a second one. If you receive an e-mail on your iOS device that has a Visio document as an attachment, just click on it. 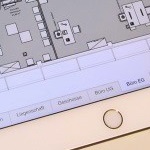 Your iPad will pop-up a list of choices for viewing the file. I like that I could still choose between the two viewers that I have installed, and getting to viewing was easy enough. I did happen to try e-mailing a zipped file to myself. The iPad didn’t really seem smart enough to look inside the zip file, offer a list of contents, then proceed to offer the same choices that I got when opening the non-zipped attachment. This seems to be more of an iPad problem, or perhaps it is a Visio Guy problem. Perhaps I need to install some sort of zip-handler app on the iPad. 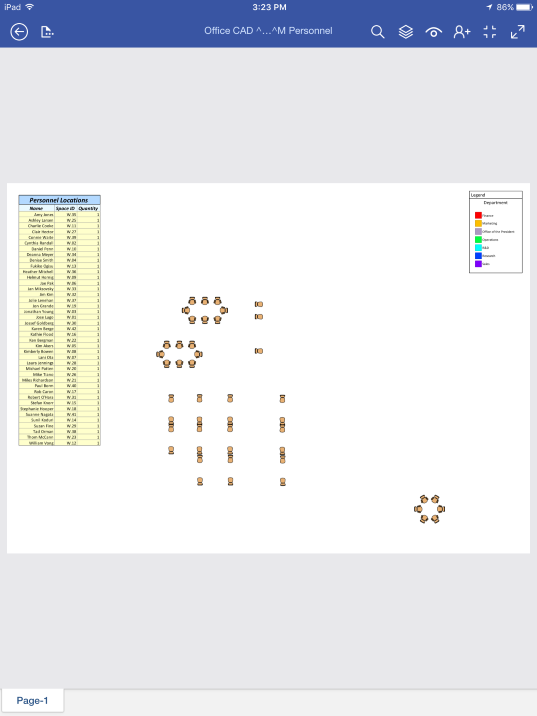 I have by no means spent days upon days performing rigorous tests of the Visio Viewer, but I figured I had better at least start with the files I threw at Nektony’s viewer, then finish up with observations and ideas that popped into my head while I worked with the product. Hopefully some of the points below will save you some time and help with any purchasing/deployment/workflow decisions you are facing. The first document I loaded was the file that I had used to test Nektony’s app. I had put in all sorts of tricky Visio effects like sketch-style themed flowchart shapes, 3D effects, bitmaps and metafiles. Microsoft’s viewer handled everything just fine. 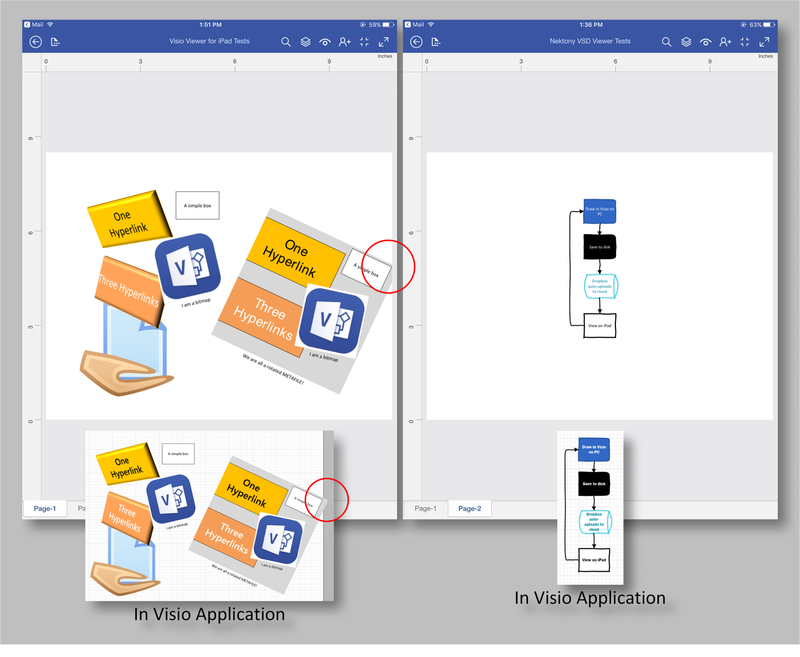 You can see clips from the actual Visio application below the iPad screenshots. Nektony’s viewer had problems with some of the foreign objects and fancy effects. So coming directly from the horse’s mouth has its advantages! One thing that bugged me is that the Visio files were clipped at the page border–that is, objects in the pasteboard (gray, off-page area) were not displayed. Look at the red circles in the image above to see what I am talking about. I often put notes and temporary junk in the off-page area–especially when I am still working on a document. 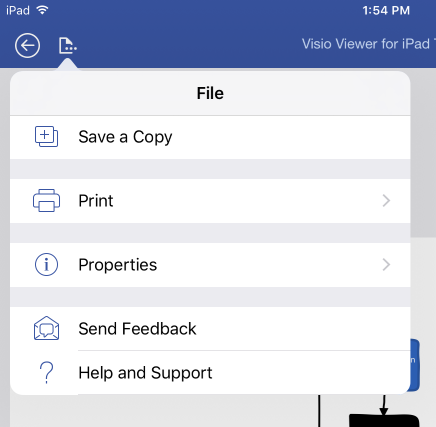 I would think that iOS-viewing of Visio files would be an important part of review processes, so being able to see off-page comments could potentially be a big deal for some customers. 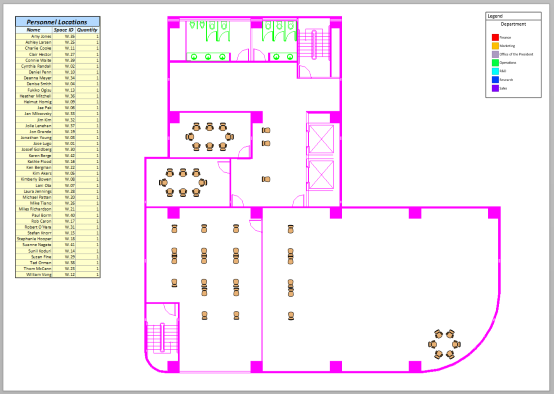 Continuing to test Microsoft’s viewer with the same things I subjected Nektony’s to, I fired up a floorplan from David Parker‘s webcast on Visio and AutoCAD. This drawing has a real, live AutoCAD embedded object in it. But Mr. Parker also traced over it with actual Visio wall shapes. So I had to be careful with the test. However, if you turn off all of the layers except the “CAD Drawing” layer, you then can see the AutoCAD bits underneath in hot pink. Sneaky! There was an option to Select All, which lets you turn all layers on or off, so you can start with the easiest option (all on or all off) and do fewer clicks to get the view you want. (Nektony’s viewer didn’t have this option). I guess “originating from the source” doesn’t automatically mean we get everything. At least in version 1. Luckily, there is a Send Feedback link built right into the product. So you CAD folks out there, just click that little white document icon with the three dots in the top-left corner, and beg Microsoft for CAD viewer support! One last note regarding the CAD-containing drawing above. See that light-blue and yellow table on the left? That is actually an embedded Excel spreadsheet. The Nektony viewer couldn’t render that, but it looks great in Microsoft’s offering. I’ll put the rest of my feature-related observations in this sub-section, as the notes are short, and the screenshots non-existent. You can open .VSD, .VSDX and .VSDM files. That “M” stands for “macro”, and is for the newest Visio file format’s files that contain VBA code. The Nektony viewer couldn’t handle these files for some reason, but Microsoft’s Visio Viewer has no problem with them, as we would expect. Of course the macros are ignored. You won’t be running any custom macro code on your i-device. I didn’t test some of the obscure file types: .VDW, .VDX, nor did I try to open any stencils in the Viewer, because, well dinner is almost ready. You can zoom in to 200,000%. TWO-HUNDRED-THOUSAND PERCENT! You can zoom so far in that a thin black line fills the whole screen. And it is vector-graphics all the way, so the rendering is smooth and buttery. You can choose to view or hide the ruler and grid. There is a Pan Window that lets you see an overview of the entire drawing, and easily change the bits you are viewing up-close by simply dragging the pan rectangle around. You can search for text in the drawing, and the Viewer will highlight shapes that contain that text. I wasn’t able to actually select, nor copy text as I could in the Nektony viewer, however. 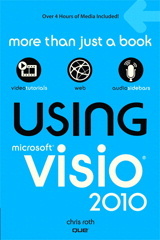 The current version of Microsoft’s Visio Viewer does NOT support the viewing of Shape Data stored in individual shapes. There doesn’t currently seem to be a way of even selecting shapes. Since Microsoft if into “cloud-first” computing, I would bet that the Visio team will implement something like this in the future. I appears that for this release, they are really focusing on a good-quality viewing experience, and they have definitely achieved that. If you need Shape Data now, then be sure to check out Nektony’s viewer, because the display shape data on multiple shapes at once, which is pretty cool. I was surprised to see that the Viewer didn’t support hyperlinks. Strange, but again: version 1! I would bet that hyperlink support will surely come in a future update. 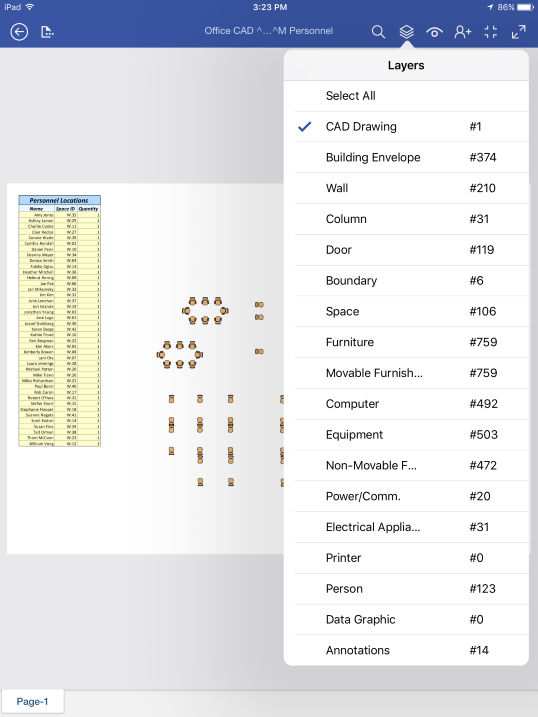 One thing to keep in mind with Visio: shapes can have multiple hyperlinks. So any implementation of the future needs to be carefully thought out and build correctly so that the experience isn’t sloppy. I ran some quick load tests on both an iPad and an iPhone. The document I loaded was fairly complex: it contained 10 pages. 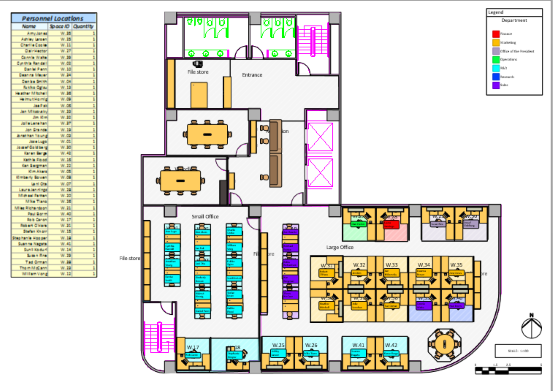 Of these, 5 were detailed floorplans of an office space. These pages had around 470 shapes (not counting subshapes within groups), so the drawings were pretty detailed. I was surprised that the VSDX loaded so slowly. It has a smaller file size, so the download should have been quicker. Also, because of the structure of VSDX files, I thought that it was easier to look at one page at a time, without having to load (and parse?) the entire document at load. The test document has a long history, and began life many years ago as a VSD, so maybe it has a bunch of legacy junk mucking it up, and the VSDX version is ideal. Let us know how fast or slow your documents load in the comments below. Anyway, there’s some quick numbers for you, but by no means a rigorous, scientific test. All in all, I found this to be a solid first attempt. Yes there are features missing, but the product felt solid and looked good. Other than slow load times, it performed snappily and didn’t crash. Since Microsoft has a team working on this, you should expect updates and feature-set expansion. I don’t have a list of what’s coming, nor can I promise anything, but I think steady improvement is a safe bet. Also, since Microsoft owns Visio, they have access to all the internal secrets of Visio’s file format and code. That gives them an advantage over third parties like Nektony, who have to “crack the file format” to figure out how to render the myriad possibilities of vectors, bitmaps, metafiles and other objects that can be stuffed into a Visio document. Renders 3D effects, bitmaps, metafiles, theme effects, and embedded Excel reports!